Hi, I’m Alicia’s daughter, Lacey. I want to help you with your promotion needs. I am offering services to help you cut back on time you spend marekting, and still get your name out, daily, on social media. 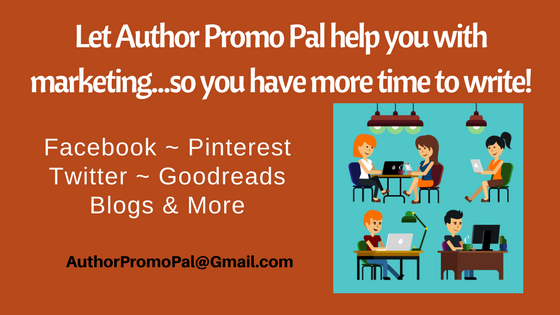 Three packages to choose from to take the marketing pressure off you, the author, so your time can be better spent creating stories. You may choose to use the service for one month only, or monthly. (When you buy a one month package and continue the services, the following months are at a 10% discount – Not to be used in conjunction with the referral discount) Each month you may feature a different book) Obviously, sales cannot be guaranteed, but your exposure will increase. Your book will be purchased and read (A review is possible, but not guaranteed. If a review is written, it will be posted to Amazon, Goodreads, Barnes and Noble (if your book is available there) and also shared via Twitter.) – Even if the book is not reviewed, the promotion will be more personalized. Lines will be used from your book and your book will be shared through various additonal promo avenues.